The journey to one of comics’ biggest wedding continues in Batman #44. The Batman/Catwoman dynamic duo have divulged their biggest secrets, met each other’s friends and saved the world together. Now, Catwoman’s on her most important mission: finding her wedding dress. Writer Tom King and artists Mikel Janin and Joelle Jones have presented an entertaining issue that answers some questions fan may be asking themselves and offers an interesting perspective on the nature of Batman and Catwoman’s relationship. There are two separate stories happening, one is Catwoman simply looking for her wedding dress, in a way that’s totally befitting of Selina Kyle. The second story is a bit more fascinating. It chronicles the couple’s long past and when its laid out in front of you, it feels like they’ve been engaged in one long relationship, with all the ups and downs. There’s a question that Bruce asks Selina that fans have most likely been asking since the start of their new courtship, what makes this time different, how do they know it’ll work out? It remains to be seen as to whether or not this will be the status quo, but what’s new is that Bruce and Selina have stopped trying to be someone they aren’t, mainly Selina. Catwoman is a thief, but she's also not a typical comic criminal with bouts of heroism when its presented to her, that’s the way readers like her and finally it seems that Bruce has accepted this fact about his wife-to-be and has moved on from it. It’s fun to see Batman and Catwoman throughout the many periods of comic history, that's evident through the changes in their costumes. Eagle-eyed fans will be able to pinpoint the different eras such Selina’s purple catsuit of the 90’s and the Jim Lee drawn storyline Hush. Unfortunately, while Selina dives deep into her wardrobe, with some costume veering into the obscure, Bruce’s costumes don’t go through the same radical changes. They only really change color schemes, but not overall form. It would have been fun to see the first Batman suit or maybe even a play on the Adam West suit, but it’s played pretty safe on his end. The art is a team up between Mikel Janin and Joelle Jones with each taking point on the two stories. Janin handles the flashback story and Jones draws Selina’s search for the perfect dress. Jones seems to have a lot of fun drawing Selina, showing little details in the her face as she tries on dresses in a stores she’s just broken into. Selina’s carefree attitude and swagger shines through her body language and Jones’s detail in the fabled dress is a marvel. 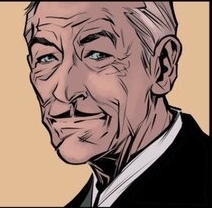 There’s an interesting art quirk at the end where it seems Jones has modeled Alfred after Sir Ian Mckellan, specifically from the film Richard III. Janin’s art does its job, but it’s a shame he doesn’t have more fun playing with the tropes of the past. In previous issues he would astound with beautifully detail splash pages, but, sadly, there are none present here. Batman #44 is a fun lead up to the main event and its safe to say that there will be more twist and turns and this wedding won’t play out the way most people will expect. Some readers may be annoyed that the main title Batman ongoing is practically devoid of its signature action and mystery, but it’s a nice change of pace and has had some much needed character growth. It’ll be interesting to see if this wedding will go down in history as a defining moment in comics or retconned away.